One person’s eyesore can be another person’s art. Modern wind turbines fascinate me. I find them to be graceful and stately works art. I do realize that not everyone feels the same way, for example, a small yet powerful group of people living around Cape Cod. I was visiting my home town near Wilkes-Barre, PA last September and was gratified to see 12 wind turbines up on the eastern ridge of the Wyoming Valley spinning slowly while generating clean and renewable energy. When operating at their full capacity, the turbines collectively provide enough electricity to power about 24,000 homes. I had to get up close to them for a better look. I wrote a blog article about it last October. Last week I toured the Front Range Energy ethanol plant in Windsor along with 9 other members of the Northern Colorado Clean Energy Network many of whom are also members of the Northern Colorado Renewable Energy Society. I had requested the tour because I had a desire to see this facility up close to find out what is involved in an operation capable of producing 40 million gallons of ethanol per year. The company manager, Dan R. Sanders, and FRE employees very graciously set up a tour for our group and explained the details of ethanol production at the facility. Ethanol has been an additive in auto fuels in the U.S. for many years. In addition to making the gasoline burn cleaner, ethanol increases the fuel’s octane rating and helps reduce our dependence on imported gasoline by more than 5 billion gallons per year. While this is still a small percentage of the U.S. consumption rate of 140 billion gallons of gasoline each year, its recent growth rate is impressive as is the rate of ethanol plant expansion and construction. I’ve written about E85 ethanol previously, including using it in vehicles that were not designed for it as well as in aircraft. I am aware that ethanol is still controversial in some circles primarily due to some persistent myths such as it taking more energy to produce a gallon of ethanol than it returns, which is not true. Ethanol production in this country provides 40% more energy than it requires to produce it and that number continues to improve, but more importantly, ethanol’s energy has 3 times the value to consumers than the type of energy it uses, which is usually natural gas. When it comes to energy, some types of energy are worth much more than others because of convenience or compatibility with existing infrastructure. It’s the reason you probably don’t heat your house with coal, even though it’s the cheapest fuel per BTU by a significant margin. The Front Range Energy plant was built in 2005 and began producing ethanol in 2006. Our tour included a 35 minute presentation to describe the operation in detail by Amanda Huber, the process manager, who walked us through each step in the highly automated process of converting corn into ethanol. She also answered many questions from our members. We were then taken through the facility by the company manager to see and hear all the equipment up close. The words that come to mind to describe the plant’s equipment are large, loud, and highly automated. There are many large cylindrical tanks connected with numerous pipes and pumps. The smell of the plant reminded me of the smell of our kitchen when we make pizza dough. The corn arrives to the plant by both truck and rail and is stored in two impressively large 500,000 bushel storage silos. The corn from local growers arrives by truck and the corn from outside the region, primarily Nebraska, arrives by train. From the storage silos, the corn moves by conveyor to the hammer mills where flailing hammers pound the dried kernels through screens containing holes that will only allow particles smaller than about 1/10 of an inch to pass. This helps to expose the starch inside the kernel, which accounts for about 65% of the corn by weight. From the hammer mills, the corn passes to the slurry blender which mixes it with water and enzymes and cooks for several hours. It is inside this slurry cooker that enzymes begin to break the corn starches down into fermentable sugars. From the slurry cooker, the mixture passes through some liquefaction stages and then on to one of four 535,000-gallon fermentation tanks. Additional enzymes and yeast are added to the mash, as it’s called at this stage, and it is allowed to ferment for about 50 hours. This stage is critical to monitor because it’s where the sugars are converted to alcohol and if this process is not properly controlled, it could ruin the entire batch. They use a combination of analytical instrumentation to monitor the health of the yeast as well as the concentrations of sugar, alcohol, and acids in this tank. After the fermentation step is complete, the mixture will contain somewhere between 15-18% alcohol. Another output of the fermenters is carbon dioxide which could be vented to the atmosphere, but in this plant it is fed directly to another plant that condenses it and provides it to bottling plants for carbonating drinks and for making other CO2 products such as dry ice. The mix is moved from the fermenters to a 735,000 gallon beer well which feeds the distillers. Using a combination of heat and vacuum, the alcohol is separated from the rest of the mix using a beer column to produce alcohol in a 70% concentration and then it is transferred to a rectifier column to get the concentration to 95%. Alcohol and water form an azeotrope at this concentration, meaning that distillation can no longer further separate the water and alcohol. So the next stage is to run the mixture through a molecular sieve to remove the remaining water and produce anhydrous ethanol. The ethanol is then denatured to make it unfit for human consumption by mixing it with about 5% gasoline. It is then pumped into one of two 500,000 gallon tanks where it awaits transportation by truck or rail car to its destination. From the bottoms of the distillation towers, the solids and water are pumped to a centrifuge which separates the water from the solids. The solids then become wet distiller’s grain which is used as an animal feed. In some plants, this grain needs to be dried so that it will not spoil during transportation and storage, but in northern Colorado, because of its proximity to numerous cattle feedlots and dairies, it can be shipped in its moist state directly to the dairies and feedlots. Trucks remove approximately 1100 tons of this material a day from the plant. If the distiller’s grain had to be dried, it would more than double the amount of natural gas consumed by the plant, so there is definitely a benefit to having large meat packing and dairy industries nearby. I have simplified my description of this process considerably. There are many auxiliary steps to achieve a high level of efficiency for the plant. For example, there are steps for adding nitrogen to the fermenters, recycling the water, regenerating the molecular sieve, extracting and remixing syrup with the grain, and recovering alcohol which I did not mention. This plant has a lot of very sophisticated and finely-controlled processes. If you’d like to see a little more detail, there is an explanation complete with a diagram at the ICM website, the company that designed and built the FRE plant. As an engineer, one area I found particularly fascinating was the control room which had a series of computer screens that showed a pictorial view of the real-time status of every level, temperature, flow, and pressure of the entire process from beginning to end, all being monitored by one person. The plant is so automated that it can be run by as few as 3 people. The plant only requires 32 full time employees to run a 24-hour a day, 365-day per year schedule. 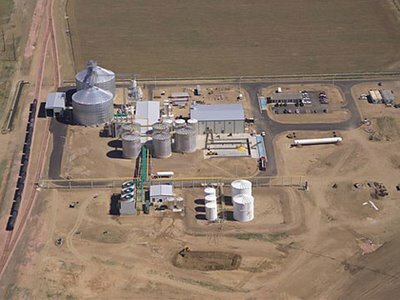 The plant is able to process 55,000 bushels of corn into 145,000 gallons of ethanol every day of the week and have minimal plant downtime, typically less than 7 days over the course of a year. The plant achieves a yield of 2.7 gallons of ethanol per bushel of corn. I was curious to know how close to the nameplate value this plant was producing. I had interpreted the nameplate value to be the maximum output if everything ran perfectly every hour of the year. I was very impressed that the plant regularly exceeds the 40M gallon per year nameplate value by more than 20%. So, unlike power generating plants, an ethanol plant has a conservative nameplate value to take into consideration issues that may cause periodic downtime. Another thing that impressed me was how aware the company manager was of power consumption in the plant. At this plant, a gallon of ethanol requires 15,000 BTU in natural gas and .5 kWh of electric energy. Since ethanol contains 76,300 BTU per gallon of thermal energy, and .5kWh is equal about 1600 BTUs, the excess energy is about 60,000 BTU per gallon. There is a controversial study by Pimentel and Patzek that is referenced frequently by skeptics about how ethanol has a negative energy balance of 20% meaning that it takes 20% more energy to produce ethanol that it delivers as fuel. However, two separate USDA studies contradict that study, the most recent one showing a 40% net positive energy balance. Yet the numbers the USDA uses, often called ‘optimistic’ by critics, are not as high as the actual numbers from this operating plant. For example, the USDA cites portion of energy attributed to the ethanol plant as 49,700 BTU/gallon. Yet here is an actual plant using only 16,600 BTU in combined natural gas and electricity per gallon. Even if they had to dry the distiller’s grain, they’d still be under 34,000 BTU/gallon. So I don’t think that the USDA study is overly optimistic. It seems to me to be very conservative. And, like I mentioned before, energy balance is only part of the equation. The cost per BTU of various forms of energy vary significantly so if you take one type of energy that is worth $7/MBTU, such as natural gas, and covert it into energy that is worth $23/MBTU, such as automotive fuel, then energy balance is overshadowed by the net increase in economic value of the energy. I got a lot of positive feedback from the rest of the members about the plant tour. It was a great to have a chance to see firsthand how ethanol is made. We really appreciated the professionalism and hospitality shown to us by the knowledgeable staff at the Front Range Energy plant. I realize that many of my postings haven’t been of a personal nature, so for those of you who read this blog and may have gotten tired of reading articles about energy, here’s something more personal. A lot of people have been asking to ask me how I like ‘retirement’. For those of you who do not know me personally, I took a voluntary enhanced early retirement from HP in June of last year. I was 47 at the time. One third of HP’s U.S. workforce was eligible for this program, some as young as age 43. Terri and I have been avoiding layoffs for the past 6 years. I’ve survived 3 near layoffs and Terri has survived 4 of them. Prior to that time, it was virtually a given that you could work for HP or Agilent until you reached retirement age, but with much of the high technology industry moving to Asia, that’s no longer the case. Many good people have been forced to find work elsewhere. Dodging layoffs while working harder than ever takes considerable joy out of one’s livelihood. When HP offered an early retirement incentive program, I felt that it could very well be the last generous voluntary separation package ever offered. I thought it would be good to leave on a high note after 24 years of loyal service. In my last position at HP I had helped to initiate and introduce a new product category of network-attached storage products for the home that resulted in a new charter for my division. I am proud of the products and so I left with a sense of having done something worthwhile as my last contribution to the company. One of my fears about leaving HP was that I didn’t want to do it on bad terms like having my program abruptly cancelled followed by a hasty bum’s rush out the door. There were other divisions reducing staff at the Fort Collins site and some of my colleagues were looking for landing spots. I helped to provide one by leaving the company. I have no regrets about leaving. My wife and I have no debt and have contributed to our voluntary individual retirement plans for our entire careers. That turned out to be a good thing because my voluntary plan was worth quite a bit more than my standard retirement plan. As many people are finding out, an employer’s defined-benefit pension many not require the employer to actually pay you anything from a legal standpoint. It is within an employer’s rights to amend or cancel virtually any retirement benefit for which there is no contractual obligation. Like most employees, I had no employment contract for my retirement benefits. So getting the equivalent lump sum value of a retirement plan (discounted, of course, to its net present value) can be attractive compared to the risk of getting nothing should an employer be financially unable to meet those obligations some 20 years in the future. I could also feel good about it because I was helping my employer reduce its long term financial obligations. I think that the best thing that has happened since I started working was to move toward making an individual employee’s retirement benefits portable. To make all of my retirement benefits portable, it was necessary to walk away from an established career without the option of being able to return. Leaving a job voluntarily without having another one lined up is viewed in the same realm as renouncing one’s citizenship. Many people think I was laid off. I know a lot of people in that category so even if it were true, I’d be in good company. For the first part of my ‘retirement dress rehearsal’ as I call it, I did not immediately begin looking for a job. I was able to take a summer off for the first time since I was in grade school. I really enjoyed the time off. It felt revitalizing. However, I quickly began networking to see what opportunities were available for when I was ready to go back to work. The group I have found to be most beneficial in that regard is NoCoNet, which is set up to help Northern Colorado workers and employers to find each other. There are many other benefits to this group besides finding a job and the most significant is meeting lots of new people from around the area that I may have never met otherwise. Many of the new people are volunteers in NoCoNet and other organizations. Currently, the most promising industries in Northern Colorado are those related to renewable energy. They are the only industries that seem to be attracting any significant investment and showing signs of growth. Everyone seems to realize that it’s just a matter of time before we run out of fossil fuels, the only argument is about how soon it will happen. I think it’s better to be prepared for it than to try to come up with a solution after we no longer have any affordable energy resources. Having access to low cost fossil fuel is a bit like living off an inheritance. When you’re living off an inheritance, it’s a good idea to acquire job skills before you need them so you won’t have to figure out how to do it after you’ve run out of money. So I think it’s wise to invest in alternative energy sources today before we absolutely need it. That’s one of the reasons why I’ve been researching and posting about energy-related topics. In looking back through my blog, I see I’ve written over 18 entries related to energy topics. Even though I’ve never worked in the energy industry, save for one summer at an electric utility company, I would like to know as much about it as any industry insider. I realize that’s a daunting task, but energy terminology and concepts are familiar to me. Converting from kW to HP to BTUs is something I’ve been doing in my head for as long as I can recall simply because I find the subject of energy fascinating. And I enjoy reading and writing about it as well. Back in November when Terri found for the second time in 6 months that her new job was moving to Singapore, I applied for a few positions that looked interesting. There’s a company involved in renewable energy that has called a few times but we haven’t set up an interview yet. The last time I talked with them, they thought they’d be interviewing candidates in February. Even though it’s a local position, I’d have to fly to the east coast for the interview. But I don’t know if anything will come of it. Terri managed to find a new position with just a few weeks to spare so it isn’t as important that I get a job as it was a few months ago. I generally have a few meetings each week networking with various groups and individuals. And, of course, I participate in Yahoo Groups for products I helped to design. I realized recently that I’ve posted more than 350 entries to the HP Media Vault Yahoo group since retiring. I responded to at least as many email requests in private too, so HP is still getting some work out of me despite my departure. I haven’t been flying the LongEZ or working on the Cozy as much as I thought I would. It is a surprise to me (and everyone else too) but then again, the weather has been too cold this winter for those activities. We just don’t seem to have the warm spring-like days we used to have at least once a week throughout the winter on Colorado’s Front Range anymore. With Colorado’s 350 days of sunshine per year, it was rare to see it snow on top of snow, except for up in the mountains. We’ve now had snow on our lawn for 2 months, which previously was quite rare, but it happened last year too. I’ve been wondering what’s happened to my global warming dividend. So there you have it, an update and something a little more personal than my typical blog entry. 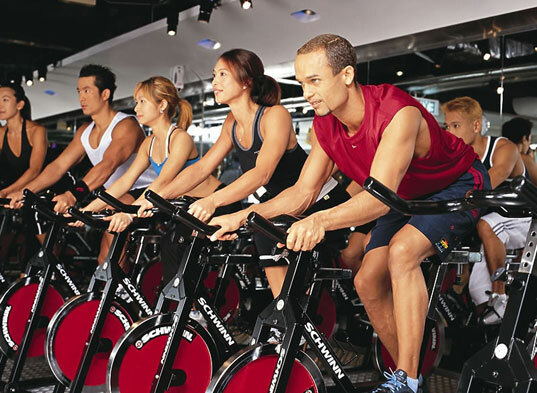 Every once in a while I read stories about people generating electricity with treadmills and bicycles by connecting them to electric generators. I read an article recently about a health club in Hong Kong that was using the energy from the human-powered exercise equipment to offset its electric bill. Whenever I read something like this, the first thing I want to do is put it in its proper context. I want to know if it’s being done for symbolic reasons to make people feel good in a ‘green sense’, or if it really has any potential to make a significant contribution to our energy needs. Before I get to that, I’d first like to talk about some terminology related to power and energy. In the U.S., you will often see the term horsepower (HP) used to describe the size of an internal combustion engine or electric motor. Horsepower is an incredibly sticky term. By that I mean that the term ‘horsepower’ helps to put a vague concept into something easier to comprehend. It was first coined by James Watt in the 1800’s in order to quantify the rate of work that could be done by steam engines. He needed a way to put the power of a machine in some context that would be easy to understand. Watt recognized that an average horse could pull a load of 180 lbs at a speed of 2 mph. Back in those days, horses were not only used for transportation but were often harnessed to large diameter rotating wheels to perform functions like lifting loads of coal or water out of a mine. In some cases the apparatus could be adapted for grinding grain at a mill. If you do the multiplication, pulling a 180 lb load at a speed of 2 mph is equivalent to 550 ft-lb/sec which is the value used to compute horsepower today. In most other parts of the world, the metric SI unit kilowatt (kW) is now used to describe mechanical power. I find it a little ironic because James Watt coined the term horsepower to put mechanical power in a recognizable context. Now, in order to honor him, we completely removed the context from the term by naming a unit of mechanical power after James Watt instead! In reality, the term ‘watt’ can be use to describe both mechanical and electrical power. Thus it makes it quite convenient to use watts so that it’s not necessary to use any computation to convert from mechanical to electrical power. With HP we need to do a little arithmetic to go back and forth. One HP is the equivalent of 746 Watts or .746 kW. Or, if you prefer, 1 kW is equal to 1.34 HP. Back when I was in college, my roommate and his mechanical engineering classmates were trying to figure out a way to split a log using a .1 HP motor. I asked why he planned to use such a small motor and he said that it was a test of their skills as designers. A man can work at a rate of .1 HP and can split wood with an axe and so it stands to reason that a few smart MEs should be able to design a machine that was as efficient as a man. They wanted to store the energy in a flywheel, but couldn’t figure out a way to get it out of the flywheel to split the wood. I recalled my uncle telling me about a device he used that was like a conical screw to split logs that was attached to a wheel on a car. With the front wheels of the car chocked and one of the rear tires removed, the conical screw was attached to the hub with the wheel lugs. With the axle supported, the conical screw would spin and even at idle have no trouble screwing itself into a sizable log and splitting it. They looked around for the device and eventually found one and were able to adapt it to their large flywheel. A version of this log splitter is still sold today . With the conical screw in combination with their flywheel and tiny .1 HP motor they were able to split logs with great success. Upon looking at the arrangement, no one thought it was going to work, but it did and they were quite happy with the result. Ever since that project, I have always recalled the number 1/10 of a HP or 75 watts in the context as what a healthy human could be expected to generate on a sustained basis. For periods shorter than an hour, a healthy human could generate about twice that amount or about 150W, and an elite athlete can generate nearly 300W (.4 HP) for as much as 8 hours. For very short bursts, a human can even exceed 1 HP. This brings me back to the original question. If you had to generate your own electricity, assuming it was a full time job of 8 hours a day, how much of your own electricity could you generate? The answer is that if you worked 5 days a week, 8 hours a day at a rate of 75W, you’d be able to generate about 12 kWh of electricity per month. This is about 1.7% of what a typical U.S. household consumes. The value of this much electricity is around $1.20. That’s $.0075/hour. Yes, it means you would not quite generate a penny’s worth of electricity per hour of pedaling effort. But I’ll bet you’d be in great physical shape in no time. I would be remiss if I didn’t include the food energy required to offset this new level of physical activity. The human body is about 20% efficient at converting food energy into mechanical energy so the 600 Wh you produce per day would need an additional 3000 Wh of food. This amounts to 10800 kJ or 2580 food calories. A typical basal metabolic rate for an average man is around 1900 calories per day, so if you were to add this level of activity to a sedentary lifestyle, you’d see some dramatic weight loss, assuming you didn’t more than double your food intake to compensate for the new hunger pangs you’d begin to feel. So now when I read about human-powered generators, I recognize that you could use something like it in an emergency to power a light, or even a laptop computer, but it would not contribute in a positive sense to a sustainable energy program because you’d likely have to double your food intake which would cost much more than the 6 cents a day of electrical energy you could produce.